What is thatch and how does it affect your lawn? We offer the good and the bad on thatch. Thatch is a word that gets thrown around a lot in the world of lawn care. But what it is and does isn’t always that obvious if you don’t happen to work “in the business”. In a healthy, robust lawn, a layer of thatch less than ½-inch thick is a good thing. It acts as a sort of mulch that keeps root’s temperatures regulated in winter and summer, helps to retain moisture, and improves tolerance to foot traffic. However, if too much thatch builds up, your lawn can suffer, pests and disease can move in, and the overall health of your lawn might quickly decline. 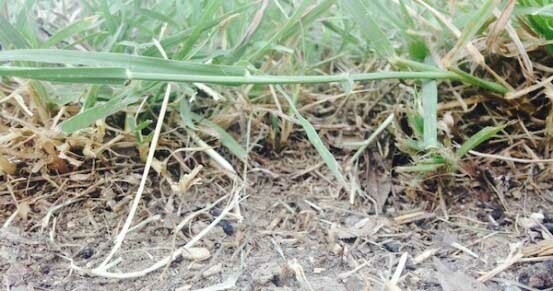 Thatch is the layer of decaying material that builds up just under the green leaf blades in your lawn. As the grass stems, leaves and roots decay, they breaks down into this layer we call thatch. As it decomposes, the thatch adds nutrients to the soil, thereby improving its texture. A normal thin layer of thatch underneath your lawn is a beneficial part of a healthy lawn’s ecosystem. When there is too much thatch, it can block water from reaching grass roots, limit air circulation, encourage a shallow root system, and keep fertilizers from reaching the soil. Over time, as thatch builds up, the lawn’s root system may actually start growing in the thatch layer, instead of directly reaching the soil. This will cause all sorts of problems with water and nutrient uptake; not to mention leave your lawn much more susceptible to both drought and frost damage. Throw in over-watering and you have a situation in which fungal diseases will breed, then weaken or kill your lawn. What causes thatch to build up? There are a few situations that cause thatch to build up faster than nature can break it down. Some species of grass naturally have a thicker thatch than others. If you allow the grass to grow too tall then leave the clippings on the lawn once you mow it. The biggest culprit however, is our tough clay soil. Regular aeration of the lawn’s soil will greatly improve the breakdown of organic matter and thatch. Note that leaving grass clippings is generally not a problem if you are watering, fertilizing and mowing properly. In fact, we highly recommend leaving the clippings on your lawn and mulching them into the grass as valuable organic matter. As long as the thatch layer doesn’t get too thick. How do you know if thatch is a problem? If your thatch layer is more than ½-inch thick. To find out, carefully cut out a small section of turf about three inches into the soil with a spade or trowel. You can’t penetrate the thatch with your finger to touch the soil. Your lawn feels spongy as you walk on it. You won’t be able to see the crowns of your turf through the thatch upon inspection. If you’re a Soil Building Program customer, we can inspect your lawn for you. Beneficial microbes in healthy soil will greatly diminish an unhealthy level of thatch. Feeding your soil regularly will encourage microbial activity in the soil to help speed up the decomposition process. Dethatching is an option but only under severe condition and it can cause more damage than it’s worth. When you dethatch a lawn, a special blade goes under the grass vertically to lift them up while cutting out the thatch. If you do decide to dethatch your lawn, it’s always best to have it done by a professional. Unnecessarily dethatching your lawn can end up causing more damage in the long run. The best way to prevent and manage thatch is by employ all the good maintenance practices we preach here at Soils Alive. Stimulate soil microbes, water, mow and fertilize properly, and your lawn will stay strong and healthy. If your soil needs aerating, give us a call!